Standing out in a crowded sales arena isn't easy. Customers are more demanding than ever. Product or service advantages don't last long. Competition comes from unexpected places. A soft economy makes for a tougher sale. Finding new and better ways to serve customers is a battle you must win each day. Sales leaders do. Sales leaders are sales professionals who help their customers take advantage of change by creating a vision of a customer solution and inspiring others to help them deliver it. Sales leaders have the courage to act in the face of uncertainty, to create confidence in place of doubt, and to inspire others to follow their lead in the solutions they create with their customers. Sales leaders are adept at meeting new challenges. They expand possibilities. They create excitement. The landscape is undeniably different. Technology, information, communication, globalization, and consolidation have changed the marketplace dramatically and will continue to do so. To excel in this environment, sales professionals must adopt new strategies. Sales leaders are defined by their willingness and ability to do so. Some salespeople continue to practice old-style sales tactics (high pressure, little understanding of customer needs, too much talking). Why? Old habits are hard to break. Salespeople who use them don't realize how aware most customers are of those tactics. But even salespeople who work honestly without pressuring customers are still vulnerable because of the vastness and speed of the information-rich Internet. Salespeople who only provide pricing or information and take orders are destined to become the dinosaurs of the information age. They can be replaced by automated ordering systems. Customers don't like wasting time with salespeople who don't add value to the buying process, and when the sale is for what are considered standard items, customers are eager to streamline the process. Streamlining the sales process isn't any different from streamlining other processes inside progressive organizations. Companies have sought to cut response time, reduce costs, and eliminate duplication. Huge sales opportunities will always be available to salespeople who go after them. (We have examples in this resource from sales organizations recognized as being among the best from sources such as Selling Power magazine.) These top sales producers win these sales by leading, not by following. Sales professionals who want to continue to be successful will realize that the world isn't the same today as it was yesterday. They know they must adapt to it. Sales professionals have to take the lead in applying new strategies that capitalize on change. They need to lead that change through their customers' and their own organizations. That is the only way to maintain a leadership position. Sales leaders must operate as the most successful and lasting businesses do: evolve to meet new demands and opportunities. Sales leaders know how to deal with change and turn it to their advantage. Effective salespeople also realize that it isn't just the number of sales calls they make that counts, but the quality of those calls. Are they calling on the right companies, at the right levels, with the right products and the right strategies? Do they create high value for the customer with their problem solving? It is a matter of being effective as opposed to being efficient - to provide the right products to the right customers and develop relationships that grow business. This resource is for sales professionals who want to be exceptional in this new environment. 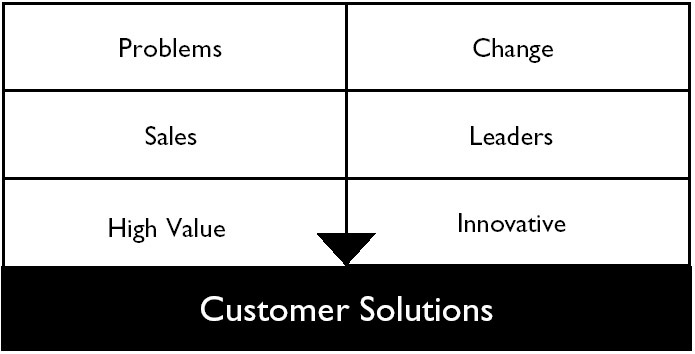 The sales leaders' model (figure 1) shows that sales professionals solve problems and create high value for their customers and that leaders capitalize on change with innovative thinking and approaches. Sales leaders focus on both of these challenges: they solve problems in an environment of rapid change, creating both high value and innovative customer solutions. Most sales professionals still face a daily test to find new ways to meet their sales quotas, broaden their customer base, and stabilize their sales revenues. This resource provides a fresh approach for overcoming such challenges and offers a unique perspective on sales and leadership for salespeople who want to stand out in their field. The salespeople who survive and prosper in the future will be those who not only have a good foundation of selling skills, but who are able to deliver high-value, innovative solutions that build lasting customer relationships and success in an environment of rapid change. This resource provides the leadership strategies that will help you accomplish that. Donald and Doris Fisher founded Gap Inc. in 1969, in San Francisco, California, with a single store and a few employees. They opened the store because they couldn't find jeans that fit well. Today, Gap has evolved into three brands and one of the world's largest specialty retailers, with sales of $3.35 billion, 165,000 employees, and 4,250 stores in 3,100 locations in the United States, United Kingdom, Canada, France, Japan, and Germany. What Donald and Doris Fisher did is what sales leaders do: be alert for problems and then look for or create solutions. To be successful in a constantly changing and highly competitive marketplace, you must be a leader. To do anything less is to leave your fate in someone else's hands. If you are not the one finding and solving new customer problems, someone else will be. This resource is not as much about selling techniques as it is about how to be effective and innovative and sell successfully for the long term. It is about leadership - doing the right things and inspiring others to follow. Part I, "Make the Sale," is about how to deliver high-value solutions in the right markets. Its focus is not how many calls to make but rather how to make the right calls. Much more than a primer on basic selling techniques, it encourages salespeople who want to be leaders in their industry to define their businesses in customers' terms and determine the specific advantages they bring to the market. It suggests that leaders consider their business model because that model may ultimately determine how quickly the business will succeed, or perhaps whether it will succeed at all. It provides recommendations for identifying the problems you can solve for your customers and then effectively positioning that message with them and delivering on your promises. It is about winning sales, building relationships, and keeping customers. Part II, "Take the Lead," provides a framework for sales leaders who create innovative solutions for their customers. It is about leading change in a sales environment. Building on Part I, it takes leadership from selling in the right markets with the right products and right positioning into understanding and challenging the status quo. It distinguishes between the concepts of management and leadership. It examines how exceptional sales leaders are able to define limits and then exceed them to deliver innovative customer solutions. It is about how to change the framework and make unique and larger sales. Part III, "Win," suggests that to be a leader for the long term requires a number of traits, such as integrity, planning, and balance. Integrity involves trust. Planning means identifying and staying with the right priorities and using time wisely; it helps you avoid the management-by-crisis mentality that can undermine your effectiveness and distract from high-value customer activities. Balance is about understanding the ultimate benefits that sales leaders can attain, depending on how they view themselves and why they do what they do. The two things that salespeople must do are to sell and to keep customers happy. It's not complicated, but it's not easy. An assignment while at IBM involved designing a sales competency model. We wanted some way of assuring ourselves that our salespeople could sell effectively. We wanted to know we could relied on them to consistently deliver results that we and customers wanted. We were especially concerned about preventing mistakes by identifying the skills or knowledge they needed ahead of time. Until we developed this competency model, we did as most companies did. We hired people. We sent them to a sales training course and did other training from time to time. We assigned them a territory. We gave them a manager. We gave them sales goals. Their territories were large, which meant that the sales manager didn't get to spend much time with each salesperson. So we weren't sure that they were doing the job as well as they could be doing it. Yes, we could measure results, but could the objectives have been higher and still have been realistic? Were they even the right objectives? We really wanted to be sure the salespeople were competent to do the job. So we developed a competency model. This model started with the two results we wanted from salespeople, sales and customer satisfaction, and worked backward from there. If the salespeople had to be able to make a quality sale and maintain customer satisfaction, what specific skills and knowledge would they need in order to do that? How would we measure their skill level in each area? How would we develop those areas that were weaker? What type of person would best match the job? Those were the questions we started with to develop the competency model. Bear in mind that competency is a lot like fluency in a foreign language. You can take a language course in school, but that doesn't mean you are fluent. Just because you know something doesn't mean you can do it well. When you represent your product or service and your company, you don't want to take a chance and find out you are not "fluent" in some important skill or product knowledge area. You lose credibility, which is costly. When sales managers have been asked for the profile of their best performers, they described them in the following ways. The best performers have a wide range of contacts within the account. They develop those multiple points of contact to expand or protect the business. They communicate with people at various levels in the organization, not just at the contact level (management, executive, and professional), and with people in various functions (engineering, finance, or product development, for example). The best performers take initiative. They take responsibility and ownership without being asked to do so. They don't ignore issues; they take action. They drive business decisions. The best performers understand business, not just sales. They work to come up with solutions that address the customer's business issues. They know how to put together a business "deal." The best performers are good communicators. They communicate with a variety of people. They get their message across, making sure it is not misunderstood or lost. They are excited about what they do and are convinced that it is the right thing to do for the customer. They don't rely on force to get things done, but are diplomatically persistent in getting people to act quickly. The best performers have a positive attitude. They may face obstacles, but they believe they can achieve their objectives in spite of those obstacles, or even because of them. They rarely (if ever) complain, whine, or commiserate; they are more likely to act to change a situation they don't like. They tend to have a good outlook on life in general, are able to look at the big picture when they need to, and often have a sense of humor that helps people feel at ease. One sales manager told me that in Europe they call it charisma. No matter where you are or what you call it, it works. This is the profile of someone who is highly competent in a range of important skills: a leader. It's someone who not only makes the sale, but influences others to follow their lead to accomplish great things. What is your competency level? How do you know? Could it be improved? What new knowledge or skills do you need to keep pace with product, technology, and industry changes? Could your attitude be improved? How much time are you willing to invest in developing professionally? Are you willing to critically evaluate your effectiveness and accept feedback? These are some of the questions exceptional sales professionals answer and act on.